As a kid, I loved taking bread rolls to my school but they were deep fried in oil, I stopped eating them as I grew older. That was till I bought the Philips Airfryer, things changed. I started making bread rolls in airfryer and indulged in guilty free pleasures of eating this yummy breakfast dish once again. Crunchy from outside and oh so soft and delicious potato filling with every bite, this is an ideal dish to make for your child for his school lunch or eat them yourself for breakfast with ginger tea. Instead of potatoes, you can stuff any filling inside the bread roll and it will taste just as good. An air fryer is a kitchen appliance that works by using high-speed hot air circulation. When the fryer is working, it begins to produce hot air and a mechanical fan begins to circulate it very fast around the food, which fry the food and produces a crispy layer. By circulating air up to 200 Celsius degrees, this appliance fry several foods like potato chips, chicken, fish or pastries and it uses no oil. I will try to make these bread rolls for my breakfast. Hi, which option to use in the airfryer? Roast, grill, toast or pizza? Also which plate to use? Baking plate or the fries baskets? I have a Philips airfryer and it does not have these options, but you can use the fries basket and roast it. It’s very delicious this recipe Swati, because you cooked in the air fryer, this machine it’s very helpful for 2 people and i’m so happy to read it in your blog, thank you . Thanks for your recipe . It’s of great help as i have just got my philips airfryer today . The recipe booklet does not have have recipe of bread rolls . Unfortunatelly I burnt it the first time as I live in a “fahrenheit” country and I miscalculated. I also left if for more time than what I should have. I tried this in my Philips Viva Collection HD9220 Air Fryer. The Bread rolls are very crispy outside and tender on the inside with all the potato stuffing. Yummy 🙂 Keep posting more recipes. The photo looks really awesome and delicious. Love the simple step by step instructions. Request your inputs on Pigeon Air fryer 3.2ltrs as I am planning to purchase the same. I have no idea how Pigeon Airfryer is. I use Philips. Excellent recipe. The photo looks really awesome and delicious. Love the simple step by step instructions. And yup, cooking fried dishes with air fryers is really a healthy alternative to using deep fryers or cooking in oil with traditional pots and pans. Thanks for posting recipes.Till now i have tried u r pulao and korma recipes.got very good comments . Now Planning to buy Air fryer,little confused,so can u plz help,need u r valuable sugestion,which brand and model should i look for. I have the Philips AirFryer and I am very happy with it. It’s a little expensive as compared to others, but well worth the price. I am so happy I bumped into your web site and this recipe. I have recently acquired the Philips Air Fryer and was experimenting with different recipes. Bread rolls used to be the favourite afternoon snacks when my kids came back from school and they just used to love them. They have grown older and I have grown old and fried stuffs are almost out of our menu these days. Your recipe gives all of us a chance to relive the old days. 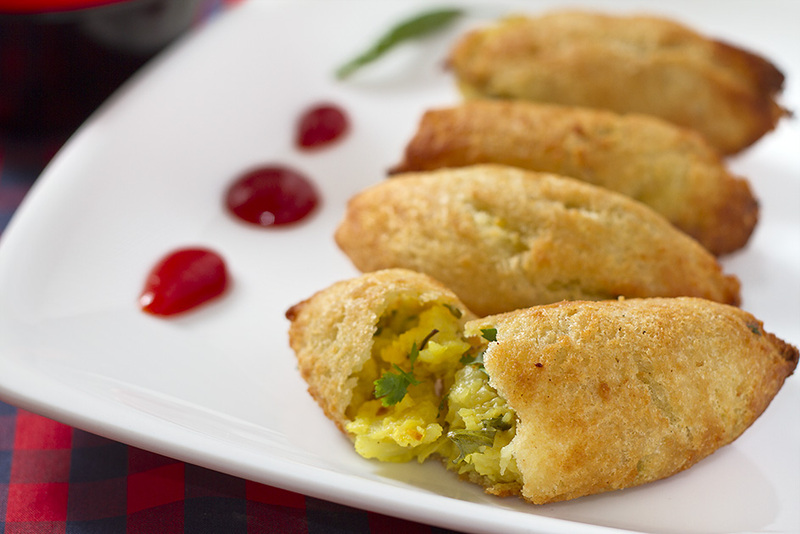 We add a bit of red chilli powder and half a teaspoonof Amchoor to the filling and it gives a bit of pep. My wife suggests we add finely chopped green chillies instead of red chilli powder. Thank you very much for the nice web site too! The Airfryer idea is a fantastic machine for a quick, easy 2 person meal and plus cooking was much healthier. I own a Philips AirFryer and use it often to enjoy French Fries, Fried Plantains, Chicken Wings, Chicken Fried Steak, Homemade Sweet Potato Tater Tots. Everybody should have one!